High schoolers are handling much of the content programming for a new digital sign deployment in their district. 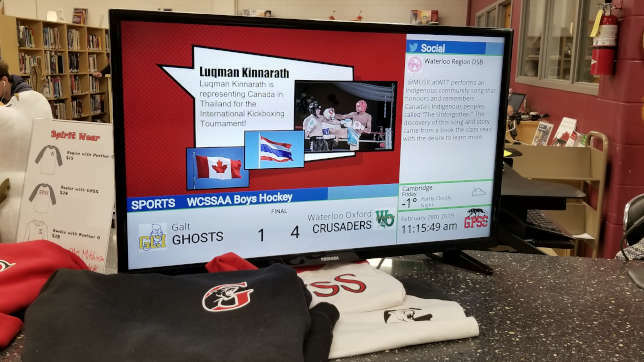 The Waterloo Region District School Board in Ontario recently set up digital display signage as a pilot project in its 16 high schools to provide updates on school sports scores, local weather, event calendars and special announcements, covering both school-specific and district material. The signage system is also running student-produced content from YouTube and Google Slides. Those students who go through training to learn how to use the system are also receiving academic credit for their work. Behind the scenes, the project is using Chameleon from Bannister Lake, which captures data from numerous incoming sources and allows the student operators, as well as faculty and staff, to moderate, edit, schedule and distribute content to various displays. "The visual nature of the medium and the immediacy of the messaging is very impactful and captures the attention of everyone in our buildings," said Jane Mitchinson-Schwartz, head teacher librarian at Glenview Park Secondary School, in a statement. "We are especially impressed with Chameleon's networking capabilities, which give the entire team the opportunity to collaborate on content." Next up, the district hopes to run student newspaper content and a broader range of community news.